Brew Coffee. Shower. Brush Teeth. Drink Water. Those daily rituals are simple, justifiable comforts that many perform every single day. I look forward to those luxuries, but I often forget the source and the work that went into providing those amenities. There are many problems that face our world, but clean water is always at the forefront. My friends in Nadus Films and I have had the fortunate opportunity to travel around the globe locking arms with various foundations who are making serious change, yet do not have the resources to produce quality content that further their initiative. When Coury Deeb approached me about the project for DayOne Response, naturally my first reaction was curiosity. In other words; what country? DayOne Response is a for-profit company that has manufactured a revolutionary container which can transform any contaminated water into clean drinkable water. Just with a few steps and patience, the bag will remarkably turn the black stagnant water, clear. DayOne Response Founder Tricia Compas-Markman recently received the title “Mother of Invention” recognized by President Bill Clinton. This water bag has saved the lives of thousands in over 22 countries and served as a crucial device in times of disaster, including the earthquakes in Haiti and Nepal. With that knowledge, I had a feeling we would be heading south to Haiti, then there was chatter on Ethiopia, which we had toured in January of 2016 for Youth Impact. Within the planning period of DayOne Response, we were also consumed with Wings Of Kilimanjaro, which hung a dark cloud over our head. So, suddenly the project took a left turn and it was decided to stay state-side. 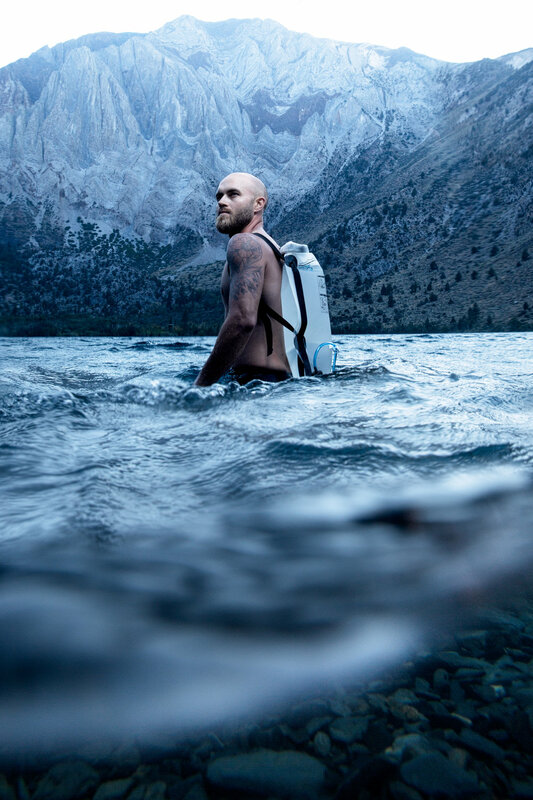 Instead, we would capture the beauty of America, alongside providing a new breath of content, which would focus on the adventure & domestic benefits of the water bag. 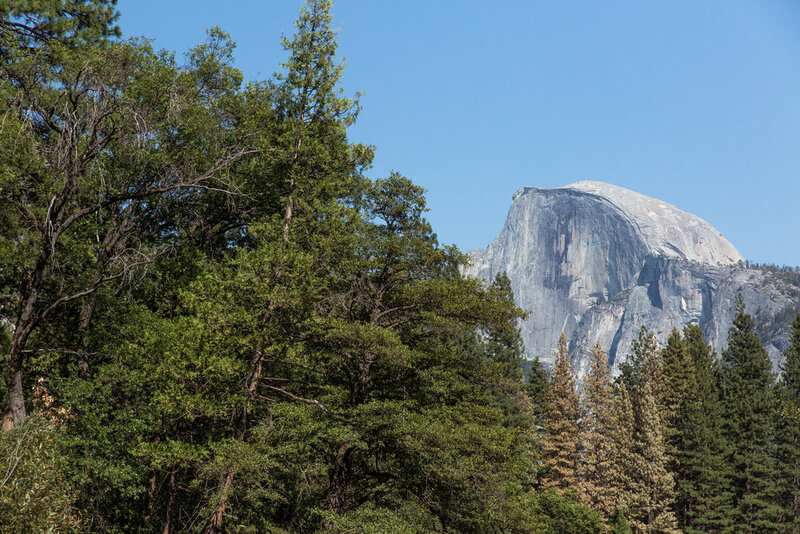 Although, I was flattened by the news that we wouldn’t be traveling to a new exotic third world country, I was thrilled when I discovered our destination; Yosemite National Park. Our project would begin with a flight to San Francisco. I had been to the city by the bay a few times over the past year, so it was not new territory. But, with Nadus Films, new experiences are always a priority. After touchdown and an atrocious wait for our rental vehicles, we skipped an early lunch and hustled over to Rockaway Beach in Pacifica, California. I’m not a sports fanatic or consider myself an avid adrenaline junkie, but the thought of balancing on a 8 foot board down the bank of breaking ocean water provided some warranted anxiety, but the good kind of anxiety. Surfing was just a perk. But, it was more then that for me, it was a completely new battle and pulling the wet suit over my body was the first in a series of struggles. With a quick zip of the backside of the suit, my body felt like it was trapped in a heated plastic wrap. 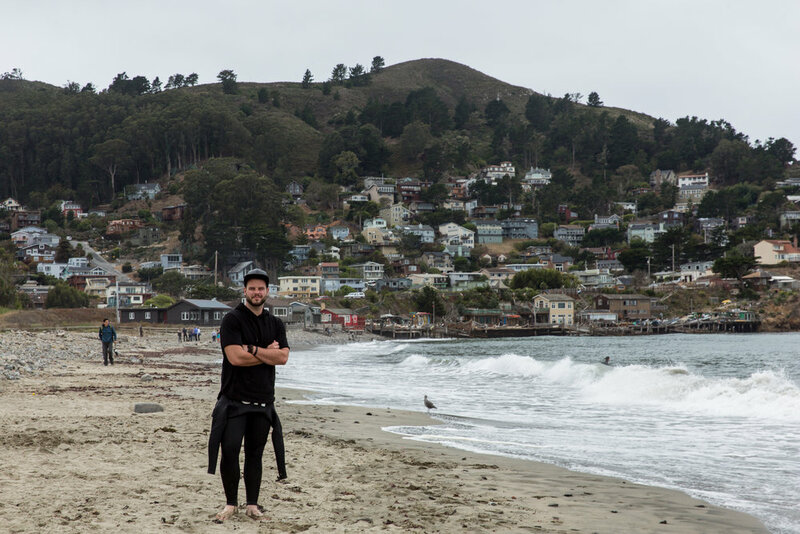 I could barley breathe and felt uncomfortable, but once I jumped in the frigid water of Rockaway Beach, I was very thankful for that skin tight body suit. Miraculously, I felt zero cold and followed the lead of our fearless director Coury Deeb who had some experience in the surf. I floated on the board and observed the experts for a few minutes. It didn’t look hard, but I quickly learned after my first run, it was very hard. Not only is it exhausting, but it also requires a lot of focus. After a series of wipe outs, I was up on the board for a short ride to the shore. Once grounded, I took a deep breath and shook off the cold salt water. I had been hit with a crashing headache and an extreme thirst. I had only been in the water for 20 minutes and it felt like I had swam a marathon. I squatted in the sand to regain my breath and removed the wet suit from my upper body; sweet relief. I decided at that moment, I was not cut out for the surf world! I called it a day and watched the team brave the ocean. Eventually, it exhausted the energy of our entire crew, so we grabbed a cocktail and bite near our hotel and headed in to get some needed rest. The adventure had only begun. I have traveled through most of America. But, I never had a chance to truly see the country; the food, the culture, the nightlife or even the people. Touring the country with the sole purpose of music leaves much to be desired in the way of culture. It’s a tunnel-vision approach to travel, with a single mission, albeit a fun mission packed with adventure and memories. Nevertheless, I never saw the country how I wanted, nor did I really care at that point in my life. Now, I have a new found respect for beauty and culture. I have a deep passion to live every single moment, whether it be a struggle or success. With camera in hand, a visual catalyst will always kickstart my intuition and I'll begin to fire the shutter like a wild animal. My eyes become a radar scanning the scene for every single detail that could possibly turn into a tangible photograph. Often, I’ll pinpoint a scene like a laser and lock in the perfect composition, but I’ll also miss many opportunitres by not being quick enough on the draw, as we barrel down a rough road. The first visual catalyst was a massive valley, lined by a towering mountain scape, covered in ponderosa pine, which seemed to stretch for as far as they eye could see. The September sun created long shadows on the craggy gray granite to create a dramatic landscape. It was powerful and I could feel the impact of size. I was enamored, so much so, I held down the shutter for a constant two minutes, just to guarantee I had a memory. We stopped for a brief moment to admire the view and capture the scene. Our on-camera talent consisted of Blake & Jenna Maddux, a husband and wife team, owners of Elemental Climbing. Elemental Climbing offers a mobile climbing wall for events, parties or festivals, and has become wildly popular in the last year. Blake & Jenna would play our main characters for the promotional film and photography. Outside of our normal production crew of Coury Deeb and Justin Gustavision, we were also joined by Anne Deeb and DayOne Response founder and very-pregnant CEO, Tricia Compas-Markman and her husband David Markman. Our trip to Yosemite National Park began with a cup of mountain coffee from Mountain Sage in Groveland, California. A rural local coffee shop with a line out the door. Local, fair-trade, organic; a perfect morning boost for a long day of production. After entry into the park, we spent the better part of 6 hours trekking to various scenic vistas to capture beauty b-roll and photographs. We jumped from scene to scene with speed. I wasn’t completely aware of the timeline, I just scanned and shot. Eventually, we found ourselves at El Capitain, the legendary formation located on the north side of Yosemite. The rock monolith extends over 3,000 ft which reaches a total altitude of 7,570 feet. 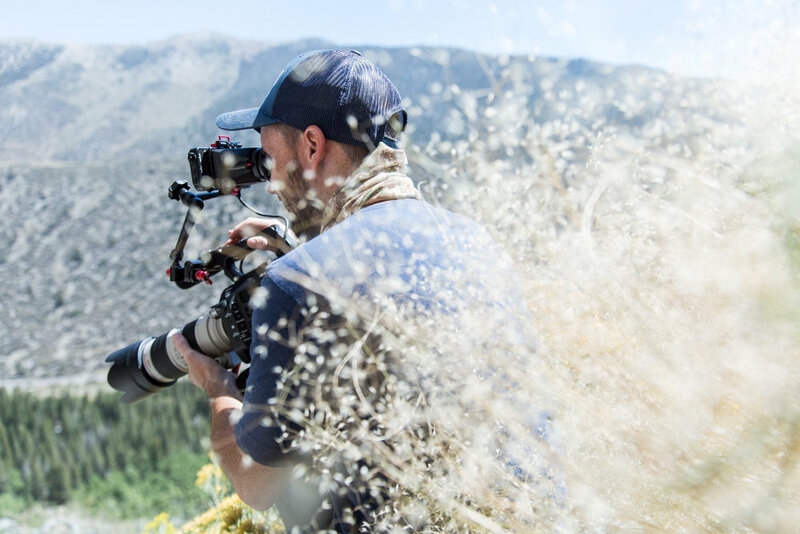 We quickly setup for a social media session and then hit the road to our next destination, Mammoth City, California, right in the heart of the Sierra Nevada. We setup shop near Convict Lake, this would be our home base for the remainder of the production. Two sites, four tents, one campfire and a whole lot of equipment. Our focus for the production was not only water, but also friendship, adventure and beauty. We had everything we needed in a small radius. We started every morning early, with an incredible cast iron breakfast sandwich and french-press coffee. The weather was cold and wet, but settled out to be completely mild. Everyday we had a semi-clear objective on what to film and where to film, but we kept it vague to open for impromptu. With only three days set for the Sierra Nevada, we first began on the base of Red Mountain near the Rock Creek Campground, we filmed Blake & Jenna bouldering, free climbing and hiking. We also had to capture footage of the water bag in use and in every application. Once we captured the necessary content, we moved across Rock Creek, which wasn’t an easy passage. Although, it was just a creek, it was wide and didn’t provide many options to cross. While the others found a dead log or a rock bridge to traverse, I just dove into the cold knee-high water. Some would say it was a stupid mistake, but I had to get ahead of the crew to get a solid shot, I try to never play in the safe zone. After a mile or so of further trekking, we found a rock to settle on, I stripped off my boots and squeezed the water from my socks. Walking over warm granite rock barefoot was magical. But, it wouldn’t last for long, we had to get climbing. Our final and most epic shot of the day would take place on the side of a 3,000 rock face. But, getting to this rock face was no easy task. It was a solid two hour climb straight up Red Mountain, through thick brush and over large boulders. I never wanted my health to be a hurdle. I had been working hard for over a year for an opportunity and adventure such as this. While, I won’t dive into my wellness journey, I was in the best shape in my life and equipped for extremities like this climb. Once we arrived at our destination, I felt strong. Blake & Jenna began to break out all of their climbing equipment and set the stage for the long vertical climb. Rated at a strong V4, it was technical. But, that didn’t stop Blake. On the production side, we began to break out the DJI Inspire Drone to capture our aerial footage. We trekked an additional 100 feet up the mountain and planted on a steep rock edge that jetted horizontally from the face, which provided a flat foundation and clear perspective. After Blake reached the top and we captured all the action, we packed and descended down the mountain. Nearly halfway, Coury noticed a Yellow Jacket hive posted underneath a small boulder. The passing provoked the bees and both Coury and I were stung. We raced down to the bottom of the valley shaking our bodies and frantically waving our arms. Although, a hilarious sight from the outside it was actually somewhat painful. Ignoring the pain, we grabbed some much needed calories and finished out the location, with a few pickup shots of the water bag. We arrived back to camp exhausted, but my job had just begun. We needed a solid promotion portrait of Trisha and Blake and my vision for the portrait had to involve a body of water. 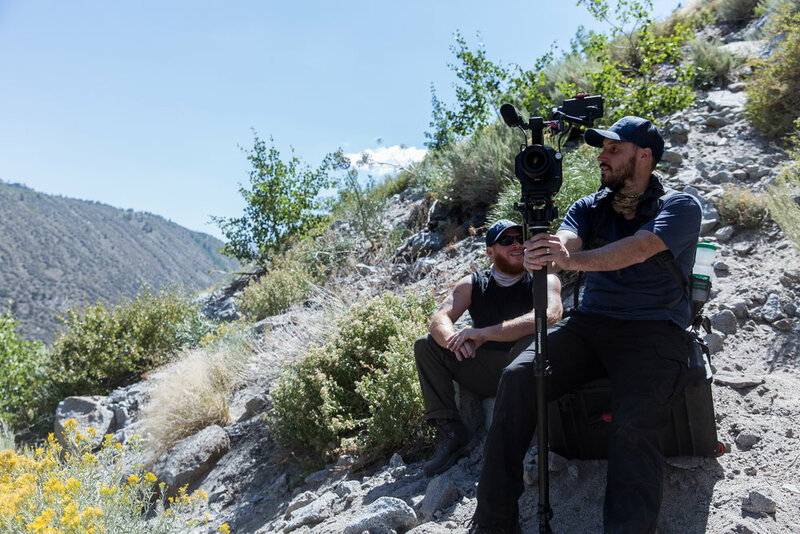 We walked down to the shores of Convict Lake and setup for the shot. The wind was strong and with the sun slowly dispersing under the Sevehah Cliff, the temperature was dropping rapidly. We had to make it quick. I put together my normal location setup; a Profoto B2 head onto a Benro Adventure Series Carbon Fiber Monopod, then attached a 46” Photek Softighter to the head. Coury Deeb would play as my assistant, he knew the job. At first, we made it work, but not without extreme resistance. Coury fought the wind by leaning all his weight into the boom pole and reinforcing the back of the umbrella with his arm. After some minor lighting adjustments and posing alterations with Trisha, we had our shot. But, the 46” Photek Softlighter, just wasn’t up to battle the wind, the umbrella arm retracted and the diffusion popped off, even with the security of binder clips. It was similar to have a giant sail on water. I made the executive decision to strip the black fabric off the backside of the umbrella to convert the modification into a shoot-thru umbrella, so that Coury could hold the modifier into the wind, rather than against it. The promotional shot of Blake would require some underwater or surface shooting, so I placed my camera into a EWA Marine Bag, which would protect my camera from getting wet. I striped down into my shorts and braved the cold water. It was shockingly cold, hypothermia cold. But, that didn’t stop us from nailing the shot. Trisha and Blake we’re subject soldiers, they wanted amazing photographs, just as much as I, but I also knew time was not on my side. I couldn’t allow more then a few minutes in the frozen water and we would also run out of natural light. So, I snapped the shutter frantically, doing my best to avoid swallowing the water in between ever shot. I dipped my camera under the surface and held it in place while calling out positive reinforcement. Most of the images were completely out of focus or completely underwater. Shivering, with no sunlight left, I called it. As I packed my haggard wind-torn equipment, I felt confident we I had a winner. All my clothing was wet. The air was cold and I had no way to dry my clothing with exception of laying it out overnight hoping time would do its due diligence. Unfortunately, I was wrong. Pulling cold, damp socks over my feet at sunrise, was a struggle. Fortunately, comforts such as hot coffee and green tea made it all seem less of a grind. Our final day in the Sierra Nevada would be our greatest adventure, yet but the least amount of production. We wanted something extravagant, such as a waterfall or cliff jump. 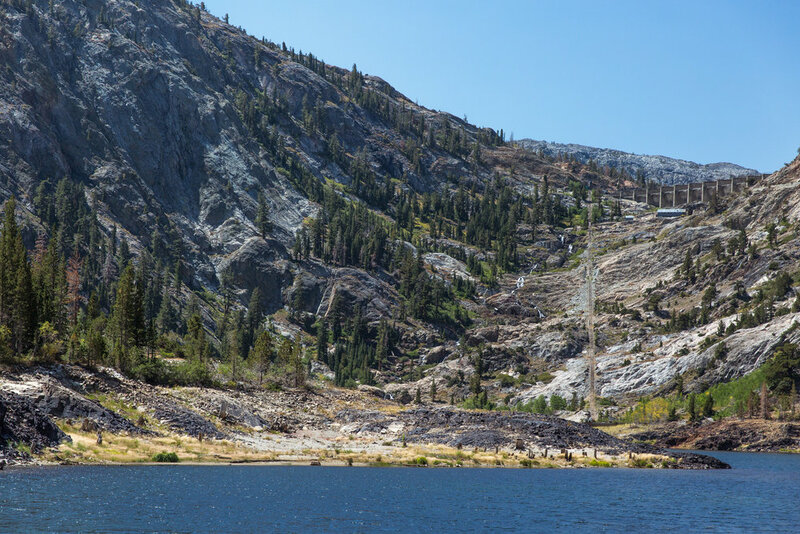 With the trusted local guidance of David, we drove the base of Carson Peak in near June Lake and began a long two mile hike up Rush Creek Trailhead to a “possible” waterfall that was around 9,000 feet at the base of Agnew Lake. With the Wings Of Kilimanjaro project in sight, I knew this would be the best altitude training I could receive, so I pushed harder, walked faster to worked further. I eventually found myself halfway through the hike alone and ahead of the pack. I soaked in the somber air and silence, capturing the beauty with rapid pace. Set into the mountainside, the landscape drops off steeply and the immediate visual would cause a brief panic impulse, but the trail is wide enough to calm any fear. Nearly a mile into the hike, we crossed a rail system that led straight up the mountain. The first section of tramway, 4,800 feet long, runs from Silver Lake up to Agnew Lake, with a rise in elevation of 1,250 feet. Despite the warning signs, we shot straight up the rail. A few switchbacks later, we were at Agnew Lake at 8,508 feet elevation. We trekked past all the dam equipment including broken buildings, pipes, and the dam itself. We noticed a giant waterfall in the distance and hiked further to investigate, but soon found it to be completely out of reach. We backtracked and settled on a small waterfall into Rush Creek. The water was cold, but clear and clean to the eye. Without hesitation, we stripped down and battled the chill to stand underneath the waterfall. After absorbing the moment, we bathed in the warm sun and hydrated for about half an hour before descending back down to Silver Lake. Our next objective for the last hour of day was to capture vital drone footage of the 2017 4Runner SUV that Toyota provided for the production. 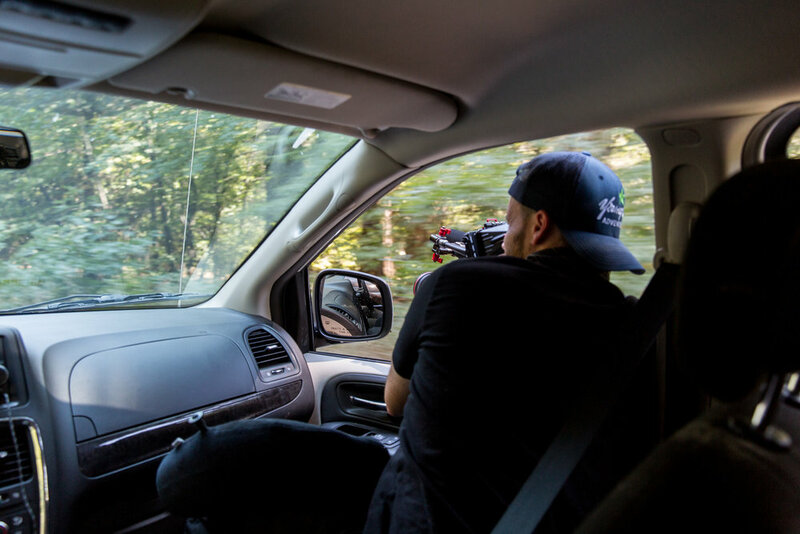 David had scouted an open abandoned road a few miles from our campsite and jumped on the opportunity to drive off-road. I shouted direction over the radio, as we flew the drone back and forth for the perfect sunset shot. It was beautiful and a perfect way to wrap up the production. The evening came to a close with a campfire and a much needed bottle of wine to celebrate. The drive back into the city of San Francisco was wearisome. I had put off some client obligations to focus on DayOne Response and had to play catch up. I occasionally gained a signal from my remote Wi-Fi hub and would anxiously wait to upload images and send off email. Once we arrived to San Francisco, we had to organize. Gear was everywhere and it was covered in wet mud, dust and rock. I felt the same as the gear looked. Haggard, dirty and deranged. Slowly, I began to pull myself together with the comfortable luxuries we tend to take for granted; a hot shower and a warm plush bed. I’ve have seen poverty in many dark corners of the earth and at the core of it all... is water. It was a blessing be apart of the impact that this revolutionary water bag has on the world. As I recount this production for DayOne Response, I can only consider it a warm-up to the production that would follow, in which our body, mind and spirit would truly be put to the test.